With the presence of a large pool of participants, the global biolubricant market is displaying a highly competitive business landscape, finds a new research report by Zion Market Research (ZMR). Total S.A., BP PLC, Royal Dutch Shell PLC, Panolin AG, Fuchs Petrolub AG, Albemarle Corporation, ExxonMobil Corporation, RoWe Mineralolwerk GmbH, and Chevron Corporation are some of the key vendors of biolubricant across the world. These players are focusing aggressively on innovation, as well as on including advanced technologies in their existing products. Over the coming years, they are also expected to take up partnerships and mergers and acquisitions as their key strategy for business development, states the biolubricant market study. Citing an instance, in December 2016, Sun Pharmaceutical Industries Limited – a largest Pharmaceutical firm of India-signed an exclusive licensing agreement with Moebius Medical- an Israel-based clinical stage biotech firm- for development and commercialization of latter’s osteoarthritis medicine referred as MM-II, an intra-articular biolubricant innoculation, being created to offer indicative relief to patients from mild as well as moderate osteoarthritis pain. As estimated in this report, the global biolubricant market stood at US$ 2.24 billion in 2017. Witnessing a tremendous rise during the period from 2018 to 2024, the revenue in this biolubricant market is expected to reach US$ 3.41 billion by the end of the forecast period. The main base oil types available in this biolubricant market are vegetable oil, animal oil, and others. Among them, the demand for vegetable oil is relatively higher and the trend is anticipated to remain so over the next few years, notes the research report. “Favorable features such as low toxicity, high viscosity index, high- quality lubricating features, enhanced ignition temperature, lower emissions, and multi-grade characteristics are expected to boost biolubricant market trends,” says the author of this biolubricant market study. 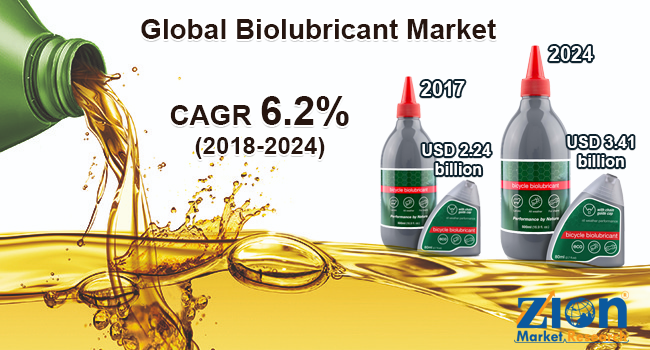 Apart from this, massive demand for eco-friendly lubricants along with rise in the supply of high-performing inexpensive green oils is anticipated to augment the expansion of biolubricant market in the ensuing years. In addition, massive trend among the manufacturers for developing new green formulations for myriad types of consumers is expected to contribute significantly towards biolubricant market earnings in the years to come. High product costs along with low adoption of biolubricant in the developed economies, however, are expected to pose a threat to the growth of biolubricant market over the coming decade. Nevertheless, prominent use of biolubricant in the automotive sector is projected to offer a wider scope for biolubricant market over the forecast timeframe. This, in turn, will normalize the adverse impact of impediments on the biolubricant market expansion, reports the study. Regionally, North America has been leading the worldwide biolubricant market and is anticipated to continue on the dominant position in the years to come, states the biolubricant market study. Strict legislations along with lesser use of traditional lubricants as well as massive preference for eco-friendly products are the key factors behind the dominance of the North America biolubricant market. The high number of market players being headquartered in North America is another significant factor that is supporting the growth of this regional biolubricant market.